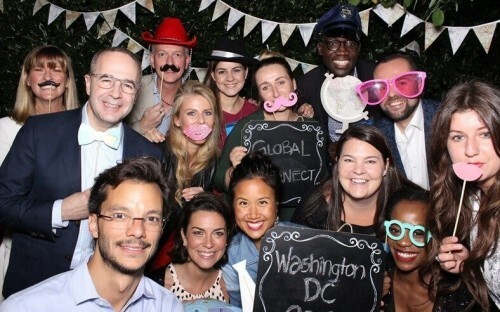 McKinsey & Company recently launched a new weekend program in Washington DC, created for graduate students and professionals based in North America who are either natives of or have an interest in pursuing opportunities in fast-growing, emerging economies. Global Connect, held between September 21st and 23rd, attracted more than 2,000 applications from which 53 attendees were selected. Among them were students studying for a JD, MA, MBA, or PhD, a medical degree, internship, or residency in North America. They were joined by professionals from the region with at least two years of working experience. While some may assume McKinsey is only interested in MBAs, the event attracted a diverse group, with more than half of attendees being MBA students; 36% experienced professionals; and 13% studying for an advanced professional degree other than business. The cocktail of professional and academic expertise was garnished with internationality. Attendees were natives of Brazil, Russia, China, India, Mexico, and South Korea, among others. They also hailed originally from Central Europe and across Latin America. Global Connect was created as a way for McKinsey to raise awareness of the opportunities for development in fast-growing emerging economies. Gustavo Tayar, a McKinsey partner based in Sao Paulo, and also one of the co-founders and hosts of Global Connect, says that it’s striking how often candidates don’t know how global the firm is, and that these opportunities exist. The “one-of-a-kind” Global Connect program, he adds, is designed to give attendees the full McKinsey experience. They learn about consulting, McKinsey, and how they solve private, public, and social sector problems all around the world. Though the event is not a one-way ticket to a full-time offer from the firm, attendees are all invited to first-round interviews—they are also connected with the recruiter from the country they are either from, or would like to work in. Acha Leke, a senior partner at McKinsey based in Johannesburg, and one of Gustavo’s fellow co-founders and hosts of Global Connect, explains that even though location might change, McKinsey doesn’t. A lot of candidates, he adds, are attracted to the prospect of working in their home countries but are often unaware McKinsey have an office there or that they themselves are a good fit for consulting. McKinsey, he says, prides itself on diversity. That means hiring scientists, lawyers, doctors, and tech types, alongside the traditional business school graduates. Candidates from non-business backgrounds should rest assured that they have the transferable problem solving, leadership, collaboration, and analytical skills that are key to a successful consulting career with McKinsey. Hiring for emerging economies also means hiring candidates keen on workplace mobility. Moving between offices and countries is part of McKinsey’s culture, so every office is made up of employees from all around the globe; Global Connect mimicked that. Edwin Llancce, a Global Connect attendee originally from Lima, Peru, and an MBA student at Michigan Ross, says that the opportunity to connect with people from all around the world drew him to the event. He adds that working with other attendees on a case study was extremely beneficial. Fellow attendees Christopher Kawsek, an MBA candidate at NYU Stern who is originally from the Philippines, and Giulianna Rawls, an MBA candidate from West Virginia University who is from Peru, assert that immersion into all things consulting is what made Global Connect stand out for them. “Through Global Connect I learned consulting is an incredibly exciting field because you get to tackle problems that matter, and you can help people. This event solidified my desire to be a consultant with McKinsey in Manila,” Christopher says. Also present was Vitor Macabu Oliveira, who hails from Brazil and is getting his LL.M from Columbia University. He explains that a career in consulting interests him because he understands the importance the sector plays in providing accurate advice to change organizations for the better. “I would really like to go back and work in my home country of Brazil to help with economic development,” he adds. Nevenka Duric, who is studying for her LL.M at American University, echoes similar sentiments. She was among the 52% of female attendees at Global Connect and says going back to her native Croatia would be an opportunity to return to where her whole life is, her family, and her friends. “What excites me about returning to my home country to work is that in emerging markets you can build something from scratch and be entrepreneurial,” she notes. McKinsey’s work in emerging economies is the sum of its internal parts. Edwin, Christopher, Giulianna, Vitor, and Nevenka, hope to be part of a consulting machine that ingrains excellence and drives development around the globe. The attraction of working in one of McKinsey’s emerging economy offices is that it offers non-natives a chance to glean other cultures and natives an opportunity to return home to help boost economic development. That’s also why Jawad Mourabet, an American-born Arab and a dual degree student studying Civil Engineering alongside an MBA at MIT Sloan, was drawn to Global Connect. “I have not lived or worked in the Middle East, but the culture is ingrained in me,” he says. “I would like to create economic viability and contribute to the growth of the region. Jawad hopes to join the more than 1,000 MBAs McKinsey hired in the recruiting year ending June 2018, a figure Brian Rolfes, McKinsey’s global head of recruitment, told BusinessBecause is set to rise in the coming year. For Brian, Global Connect shone a light on the wealth of international talent that studies or works in North America. He says he finds it encouraging that such a large number are driven by a desire to return home and work to make a difference in their native countries. “We value global citizens and it was great to meet so many at Global Connect,” he concludes.